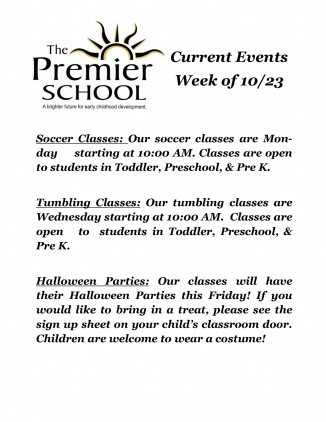 This week includes: Premier Soccer, Premier Tumbling, Halloween Parties, and Costume Parades! Premier Tumbling is an introductory tumbling class for students in toddler, preschool, and pre k. The cost is $20 for a 4 week session. The Premier School of Pickerington, LLC. Content copyright © 2015 The Premier School. Custom web design & development by CCD, LLC.